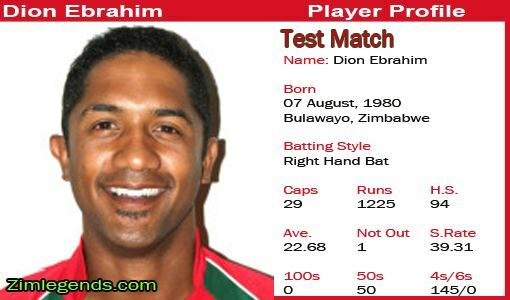 Dion Digby Ebrahim (born August 7, 1980 in Bulawayo) is a Zimbabwean cricketer. Ebrahim is a defensive batsmen who prefers to score cautiously in order to build an innings. Ebrahim has a highest One Day International score of 121 and highest Test score of 94. A graduate of the CFX Academy in Harare, Ebrahim was considered an integral part of Zimbabwean cricket until falling out of favour with authorities. After departing from Zimbabwe in 2005, he has played in UK as the captain of Stony Stratford CC who play in the Northants Premier Division. 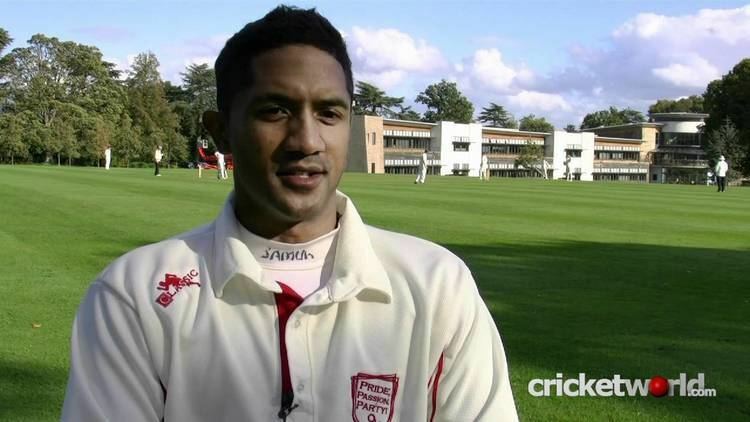 He also played in New Zealand for the Hawera United Cricket Club and Taranaki CC in the Hawke Cup. In 2009, he was contracted by Zimbabwean franchise side Matabeleland Tuskers. He was released by his kiwi club team Taranaki CC to let him play domestic cricket in Zimbabwe and push for a spot in Zimbabwean national side. He appeared for the Tuskers and thus he made himself available for national selection again. He is a prolific run scorer for Matabeleland Tuskers since his return and is a valuable member of the side. In mid-2011, he played for Shenley village in the herts league in England. He spent the 2011/12 and the 2012/13 summer playing in Taranaki, New Zealand. Dion was arrested for using a Zimbabwe Cricket sponsored car after the ZC board did not offer him a new contract. Dion's lawyer told the police that ZC did not pay Dion his outstanding match fees. It was revealed that Tatenda Taibu was also involved in the case. ZC owed both Dion and Tatenda $200,000 each in backpay. Tatenda told Associated Press that he would not give back the car until he had match fee outstandings paid to him fully. But the ZC Board said that the Ebrahim's payment is separate to the continued use of the ZC registered car. The problem remains unsolved. Dion Ebrahim Joined the ambitious Shenley Village cricket club, who Play at the excellent facilities of the Shenley Cricket centre. Dion was appointed the captain and club head coach for 2011 to spearhead the ongoing development of the clubs senior and Junior sections to help them build the complete infrastructure needed to become a premier league club. His 6 centuries helped make him only the 6th person to score 1000 league runs in a season, as well as taking 42 wickets, and steering the club to the last 8 in the county cup.